Self-empowerment, determination, discipline, focus, action, ambition, progress, victory. Forging ahead to his destination, Rhinoceros meets conflict head on, yet discovers new solutions along the way. Refusing to be sidetracked by obstacles, he determinedly takes on a challenge so that he may move onward and upward. With the confident spirit of Rhinoceros entering your realm, he’ll be your guide in accessing great determination for a successful outcome. When your energies are focused, your spirit will ignite its unlimited willpower toward your plan and purpose. 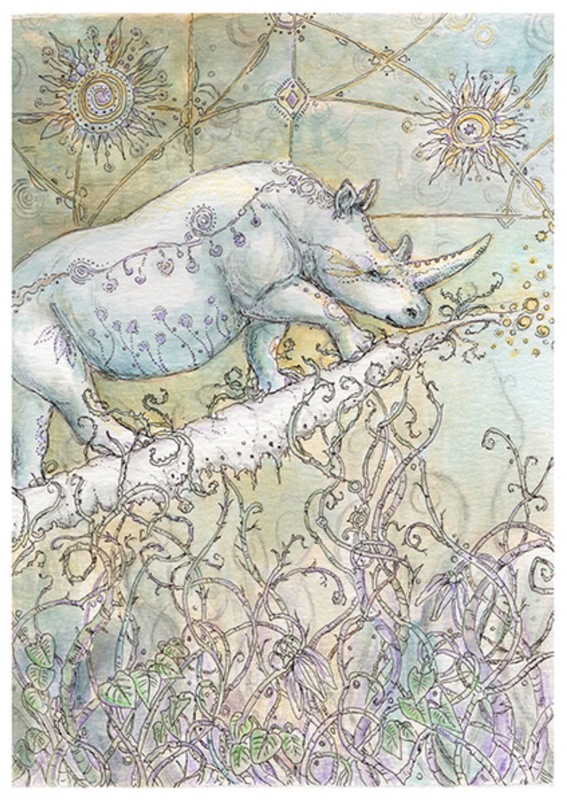 This entry was posted in Artist, Deck Review, Featured Card of the Day, General Tarot, Readings and tagged Chariot, Paulina Cassidy, Rhino, Spiritsong, Tarot.